What the Conference Are You On About? IDEAS: I want there to be interesting and challenging themes and ideas, presented in a contemporary manner. Conferences should not be about the status quo, they should be a little confrontational, they should disrupt, shake things up, all with an eye on improving learning. This I think is sometimes inhibited by the fact that applications for sessions are taken months (if not years) in advance, as well as the tendency to stand and deliver. CONNECTIONS: An important part of new ideas comes about through forming new connections. Dean Shareski argues that coming away with five new connections is more important than coming away with five new tools or ideas. I think that the challenge is to create the write conditions for this to occur. This includes the right environment, as well as structuring different activities. For example, DLTV had a makerspace at last years conference. To me this worked for I was not only able to make and do, but I was able to chat with different people while doing this. ACTION: In addition to being hands on and practical, I want the opportunity to do something meaningful. I understand that 45 minutes can be limiting, but at the very least there should be the possibility to continue to continue the ideas and connections afterwards. Maybe this is a collaborative space or shared resources. So they are a few of my ideas about conferences. I could have written a list of ‘dream’ keynotes and presentation topics, however I think that such fixed mindset overlooks the most important ingredient of them all. The most important ingredient to any conference is an openness and eagerness to learn. The question though that I am left wondering is why wait for a conference? This is something that Tom Whitby has touched upon elsewhere, I recommend reading it. So what about you? What is your ideal conference expereince? I would love to know? As always, comments welcome. 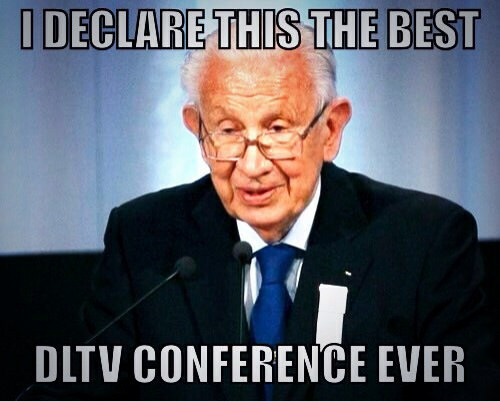 What the Conference Are You On About? by Aaron Davis is licensed under a Creative Commons Attribution-ShareAlike 4.0 International License. Hey mate, love the new blog look…very slick! I think your three elements are right on the money. Ideas need to rock the boat and disruptive happens at either end of the scale…polarising or revolutionary. Keen to know if you have any further thoughts about how to continue the conversation. From our experience, it did seem like we were keen but there wasn’t much interest from others. How does one continue the conversation when only one person is talking? Mulling this over myself but would love to know your thoughts. You can never force someone to continue the conversation, just as you can’t force someone to care or trust you, but you most definitely can provide them with opportunities. Many may ignore it, but one may take it up. Even if it is one person, then I think that it is worth it. Alan Levine made the point that a lot of learning is serendipitous and we need to be mindful of measurements. In the end, I think that you need to believe what you are doing has a purpose and go from there.